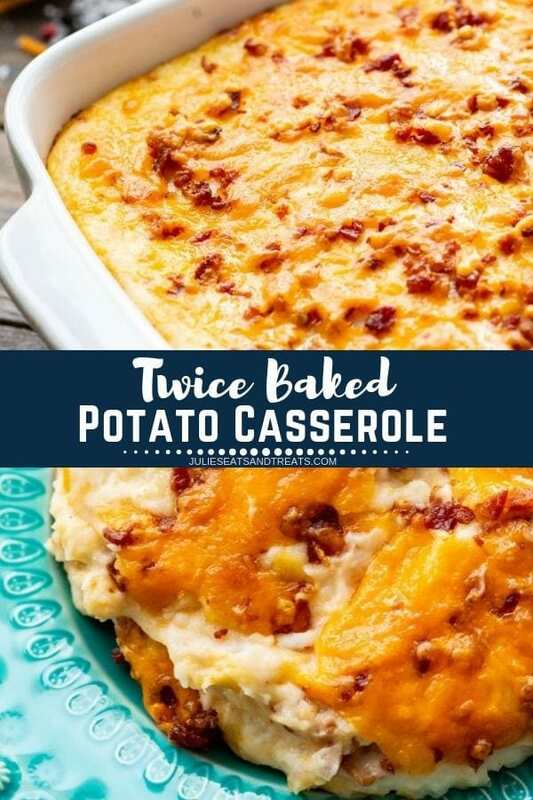 I LOVE twice baked potatoes so when I saw this recipe I knew it was right up my alley of course. 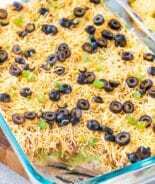 Plus this is a great make-ahead dish, love that! I was craving Sweet ‘N’ Sour Meatballs and thought a potato casserole would be the perfect accompaniment. I knew I wouldn’t have enough time to make this meal plus get to volleyball so I made both recipes and stuck them in the fridge for the next night. Then I got to looking and realized and I now had 3 lbs of meatballs and 5 lbs of potatoes. My family are hearty eaters but not quite that hearty! Time to call in reinforcements. After a quick text to my ‘lil bro and ‘lil bro in law I had rounded up my victims for devouring this potato casserole and meatballs. They raved about it. I must say I think I might call them again for when I need a confidence boost! Bro in law even said the text message was the highlight of his day and he hadn’t ate this good of a supper for over a month. He possibly could have been sucking up but I think he was just being honest! If you are in charge of the potatoes for your Easter get together these would be perfect! 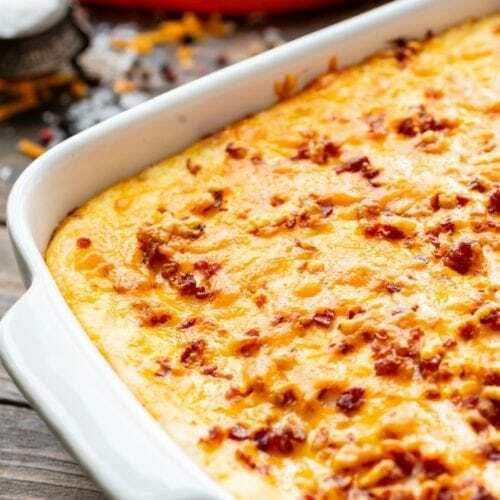 How far in advance can you make this casserole? You can make this two days ahead! Just cover it with foil and refrigerate until you’re ready to pop it in the oven. Actually yes, though most potatoes don’t freeze well, this one does! Wrapped well you can freeze leftovers for up to three months. 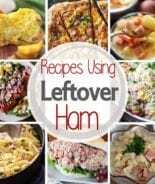 Want to repupose leftovers rather than freeze the casserole? Great here are some ideas for leftovers; fried potato pancakes, leftover potatoes make the perfect topping for shepherds pie or potato croquettes! 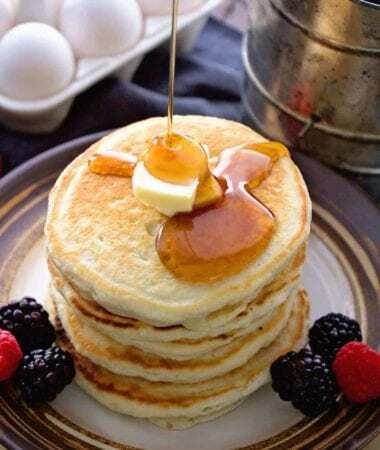 Oooh, here’s something I’ve been wanting to try… mashed potato waffles! If you try this before I do, be sure and swing back to tell me what you think! Peel potatoes and cut into chunks. Add to a large pot filled with cold water. Bring to a boil and reduce to simmer. Cook until tender and easily pierced with a fork, about 15 minutes. Drain and put in a large bowl. Using a mixer beat potatoes until light and fluffy. Mix in cream cheese, butter, sour cream and stir until combined and smooth. Add 2 c. cheddar cheese, half the bacon bits, salt and pepper, mix again. Transfer to a buttered baking dish. 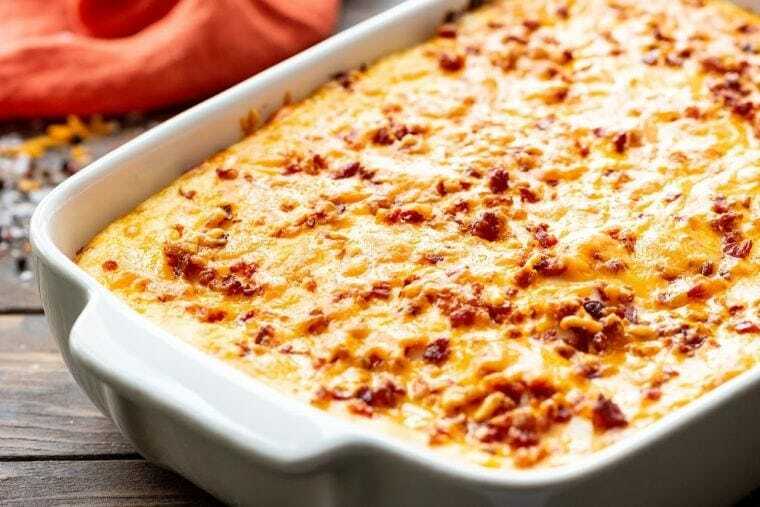 Top with cheddar cheese and bacon bits. Bake uncovered for 30 minutes until golden brown. I love twice baked potatoes but hate how time consuming they are when I’m in a hurry or need to feed a crowd. 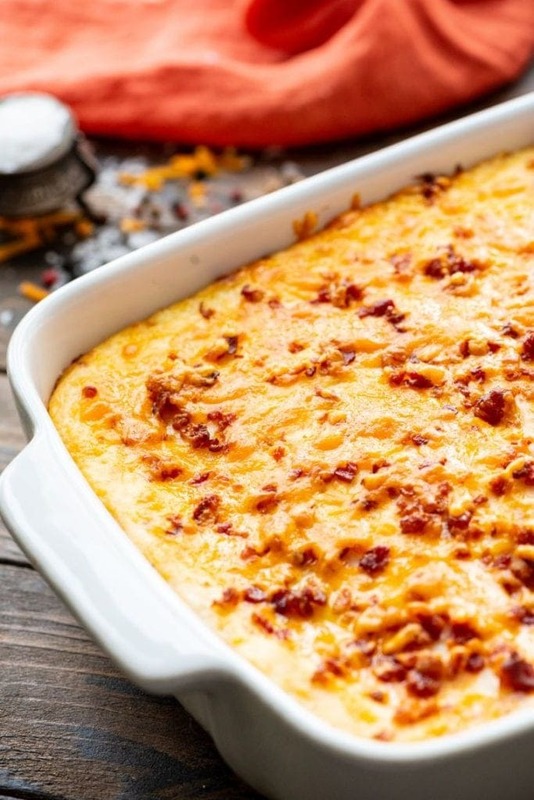 This potato casserole gives me the best of both worlds. 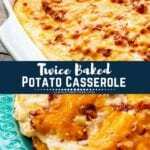 I get the amazing flavor of Twice Baked Potatoes, but it’s way easier especially when I have a lot of people to feed on holidays or when we have company. More of my favorite potato recipes!! 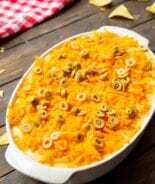 This potato casserole recipe is always a hit at holidays! 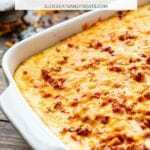 Light Fluffy Potatoes Loaded with Cheese, Bacon and Sour Cream! Peel potatoes and cut into 1 inch chunks. Place in a large pot and add enough cold water to cover. Bring to a boil and reduce to simmer. Cook until tender and easily pierced with a paring knife, about 15 minutes. Drain and put in a large bowl. Using a mixer beat potatoes until light and fluffy. Add cream cheese, butter, sour cream and stir until combined and smooth. Add 2 c. cheddar cheese, half the bacon bits, salt and pepper. Mix until well combined. Transfer to a butter 3 qt baking dish. Top with remaining 1/2 c. of cheddar cheese and bacon bits. Bake for 30 minutes or until the potatoes are heated through and the top is slightly golden brown. I made these the night before by stopping after I put them in the baking dish. The next day I just pulled them out and topped with the cheese and bacon bits. I cooked them for 45 minutes since they were cold to start. 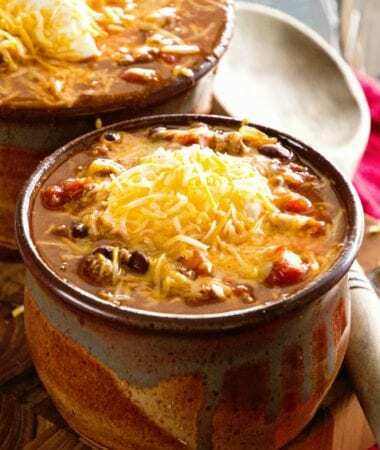 This looks very yummy- I have a recipe given to me years ago from a Mennonite woman that is very similar and so good! I love the way you put bacon bits and cheese on it. It’s me again Julie 🙂 I made these today and have them in the slow cooker for dinner tonight. I took a taste and they are delicious! I’ll be using this recipe quite often! I am going to have to try your recipe. This looks yummy! Thanks for sharing at Scrumptious Sunday! YUM!!! I do this ALL THE TIME with left over mashed potatoes. I usually make too many so I can have a quick side dish for another night. 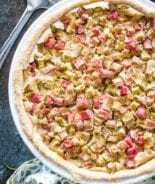 I just throw in all of the same ingredients, toss ’em into a pie plate and reheat in the oven. My son has come to expect them every time we have “PLAIN” mashed potatoes! Thanks for sharing – and glad I found you from Flour Me with Love. I love your recipes & these awesome potatoes will definitely feed a crowd. Thank you!!!! Just in time for the holidays…this one looks yummy! Hi Dee! 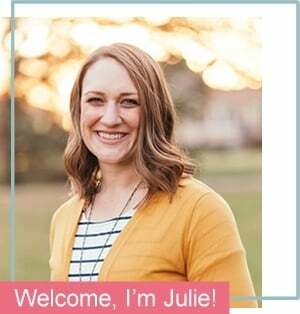 I do not provide calorie information for my recipes, but there are my online calculators you can use. I recommend using MyFitnessPal.com to calculate nutrition! 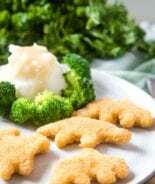 My family is always a big fan of these recipes, can’t wait to try this one! These look so comforting! I can’t wait to try! Hope you love it! So good! Can you use red potatoes with this? If so how many LBS? Thanks! It would still be 5 lbs.